The events to celebrate World Olive Day, organized by the “Captain Vassilis and Carmen Constantakopoulos” Foundation in collaboration with the Municipality of Pylos-Nestor, were concluded with great success on Friday, October 12, and Saturday, October 13, at the REX cinema in Chora, Messinia, and at a conference hall in Navarino Dunes, Costa Navarino, respectively. 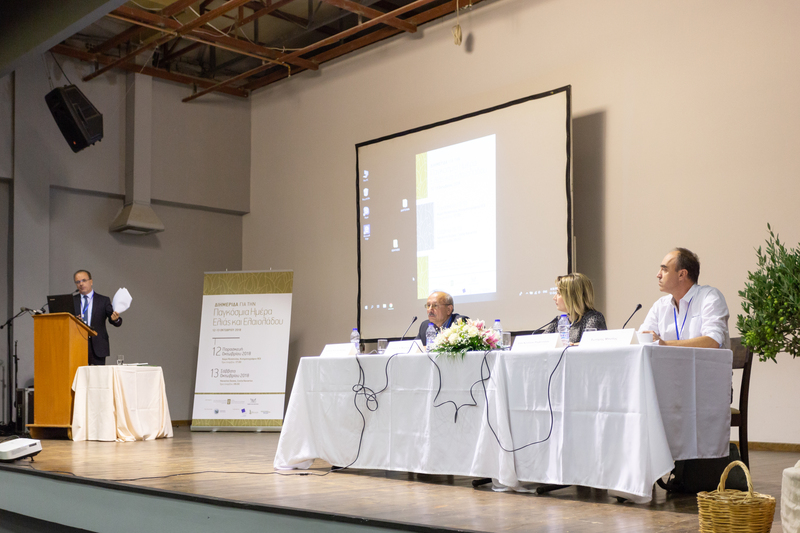 The proceedings of the seminar, which took the general title “Olive Cultivation as a Main Factor of Financial Development at a Municipal Level,” resulted in some significant observations and very useful conclusions. Participation at the seminar was high, since more than 220 producers and olive and food sector professionalsattended the talks with great interest, on both days. 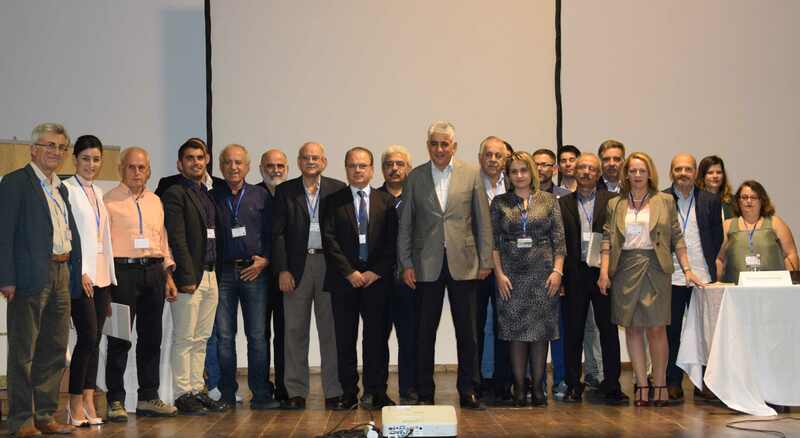 The talks centered on principal sectors in olive oil economy. The main talks during the two-day seminar were on topics connected with olive tourism, social economy in activities related to olive oil, food culture, the Mediterranean diet, precision farming, the environmental management of olive groves, the proper use of olive sub-products, and international olive oil trade. More specifically, Mr. George Marinakis, Mayor of Rethimni, presented the conclusions and data resulting from the joint municipal actions of the Association of Cretan Olive Municipalities aiming to promote and sell olive oil. Ms. Elli Kotsanou-Romvotsanou, the Municipality of Delphi’s City Council President, and President of the Commission for Tourism Development, examined topics regarding the olive grove management plan carried out by the Municipality of Delphi, as well as the opportunities to promote olive activities via the social economy sector. Mr. Sotiris Bolis, Project Manager of the Finest Greek Tastes Municipality Network, and Associate of the Regional Development Company of Parnonas, talked about topics regarding Greek food culture and the Finest Greek Tastes Municipality Network. Ms. Vicky Igglezou, Manager of the Maniatakeion Foundation, referred to the Mediterranean diet as “Intangible Cultural Heritage of Humanity,” as included in UNESCO’s representative list, analyzing the way Messinian gastronomy can be promoted as a cultural asset. Mr. Antonis Paraskevopoulos, Director of the Agricultural Economy and Veterinary Department in the Municipality of Trifilia, presented precision farming as a farm management system, the Iof2020 program, and the new technology applications in the area of Trifilia. The first day ended with the talk of Mr. George Stavropoulos, agriculturist working in the Research and Development Department of the “Korres Natural Products” company, who discussed the value of organic extra-virgin olive oil as a natural ingredient, with indisputable beneficial effects in cosmetic formulations. A discussion with the audience followed, where the speakers had the chance to further clarify points in their talks, and also provide opportunities for further fruitful discussion. Mr. Ioannis Kiriakopoulos, Director of the Agricultural Economy and Veterinary Department of Messinia, served as coordinator for the first day’s proceedings. The first presentation was by Mr. Paolo Morbidoni, President of the “Routes of Extra-Virgin PDO Umbria Olive Oil” Association, who talked about the functions and key tools of action, as well as that particular network’s advantages and weaknesses. Then it was the turn of Dr. Pantazis Pastras, Head of Research of the “Toposophy” company, who investigated the current trends in tourism and gastronomy, and presented the opportunities to promote olive oil as a key ingredient in the tourist experience. Mr. José María Penco, Technical Director of the Spanish Association of Municipalities of the Olive Tree, talked about the opportunities and the future of tourism in connection with olives and olive oil, as well as the significance of this concept for the sector; he also discussed the experiences obtained by the implementation of the European program “Oleotourism.” Next was Mr. Constantine Andrianopoulos, co-founder of the Tourism School of Kalamata, who presented the hurdles and difficulties facing the current model of tourism development in Greece, as well as the “good practices” and the need for collaborations in the tourism sector. Dr. Panayiotis Kotsios, economist and researcher at the American Farm School’s Strategic Project Management Office, presented data from the Mediterranean Countries International Olive Oil Trade, and discussed the challenges and essential conditions in order for the Greek olive oil businesses to penetrate the international markets. Closing, Mr. George Kokkinos, President of the “Nileas” Producers Group, presented the course of the “Nileas” Integrated Management Olive Oil Producers Group thus far, as well as the Olive Groves Environmental Administration as an opportunity for the environment, for people, and for the economy. A discussion with the audience followed, where the speakers were asked questions and opinions were exchanged. The seminar’s second day was coordinated by Mr. Ioannis Kapolos, Dean of the Technological Educational Institute of Peloponnese. The “Captain Vassilis and Carmen Constantakopoulos” Foundation would like to thank all participants, as well as the speakers, for their contribution to the realization of this seminar. We hope that together we will be able to contribute so that Messinia becomes a successful model of agricultural development.